As promised, Audi brought along several e-tron prototypes to this year’s Geneva Motor Show, giving the world its first official look at the all-electric SUV model. A proper unveiling is set to take place later in August, and the carmaker has given us a few details about what will feature on the production model. Firstly, the SUV offers space for up to five people along with plenty of luggage, packaged within a body that is a lot sportier than say, a Q5. A wide Singleframe grille, angular headlights, side cameras and a wide taillight setup are just some of the design highlights on the prototypes, which aren’t very far from appearing production-ready. The e-tron was first previewed by the e-tron quattro concept from the 2015 Frankfurt Motor Show, which featured a trio of electric motors with an output of 496 hp and 800 Nm of torque. The concept packed a 96 kWh battery, contributing to an all-electric range of over 500 km on a single charge. It was also able to sprint from 0-100 km/h in 4.6 seconds before hitting a top speed of 210 km/h. Mimicking the high-voltage grid, orange elements illustrate the fact that the Audi e-tron prototype is fully electric – the lower part of the car, for example, is encircled with alternating orange and black segments. IF Proton had agreed to merge with VW, we will be seeing all this rebadged as Protons. All the latest SUV becoing Proton. Now, we get China made SUV to be rebadged as Proton. Let me remind u of what u wrote, eh? Not me, bub. Thats what he wrote in previous articles. 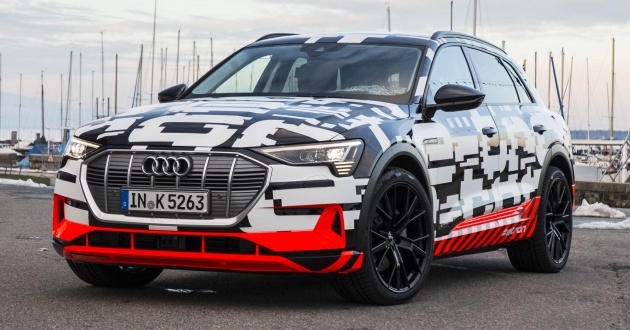 To be honest, I think it looks good as is, with the etron graphics camo and black rims.